Incredible Gulf views from the balcony of this top floor cabana at Gulf Place. Only steps from the emerald green waters of the Gulf and sugar white beaches. 1/27: Free Beach Umbrella and Two Chairs. 2/27: This is the stunning Gulf View from the oversized balcony of our Cabana. 3/27: Living area with a clear view of the Gulf and Queen size sleeper sofa. 4/27: Living & Dining area with a 46 in. flat screen TV. 11/27: Full size bath with curved shower rod. 14/27: Park Pool - One of Three Pools in Gulf Place for your convenience. 18/27: Gulf Place private Beach access directly in front of the Cabanas. 20/27: Beautiful 20 mile biking/walking trail along 30A. 22/27: Gulf Place has two newly resurfaced Tennis Courts. 23/27: The beautiful Santa Rosa Beach golf course one half mile from condo. 24/27: Gorgeous Sunsets from the beach or our balcony. Property Size 604 sq. ft.
We welcome you to a relaxing stay at our quiet, Top Floor Cabana! We have added a new feature for your convenience – Free Beach Service with beach umbrella and two chairs set up daily on the beach for your March 1 – October 31! This updated unit offers absolutely stunning views of the crystal-clear blue -green waters of the Gulf, unsurpassed in all of Gulf Place. From our oversized balcony, relax and watch the dolphins or a stunning sunset while listening to the waves roll in. Our recently upgraded kitchen with all new stainless appliances, granite countertops and stone backsplash has everything you will need to fix a meal or a picnic for the beach. We invite you to come and relax in this very special place and enjoy all of the amenities that Gulf Place has to offer. Spend a week, a long week-end, or an extended stay- this home will pamper you with everything you need for a perfect vacation, with a view that will leave you breathless! Gulf Place is a quaint little seaside village with great restaurants, shopping, a homemade ice cream and candy shop just across the street, bike and beach rentals, and activities for all ages within walking distance, including festivals, art shows, golf, tennis, free concerts in season, a 20-mile walking/biking trail that goes along 30A right in front of our condo, and of course, the most beautiful beaches in the world! 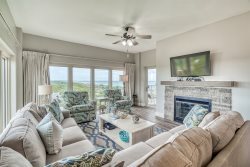 It is also minutes from Seaside and Watercolor to the East and water parks, fun parks for kids of all ages, nightlife and outlet shopping in Destin to the West, but miles away from the crowds. Spend the days relaxing on the beach with our free beach service or swimming in one of the 3 pools on site. The Cabanas has a relaxing hot tub and the pool is heated year-round. There is also a Publix and Walmart nearby. We’re sure you will enjoy your stay in our little corner of paradise. So, click on “Ask Manager a Question” and check on dates and prices for your stay. We do have weekly rates for Summer. Add $100 for housekeeping and 11% for tax. $69 damage protection; 2.5% to process credit card payments. 25% of the total is due at booking and will hold the unit for you. The remaining balance is due 30 days prior to your arrival.